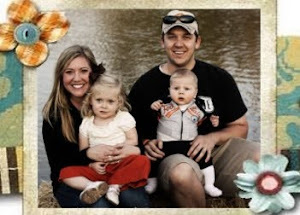 The Arbuckle Family Blog: How did Kate do at her first day of preschool (MMO)? 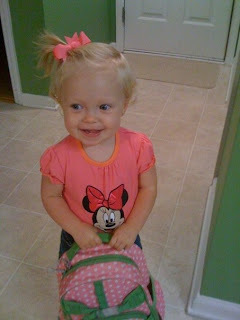 How did Kate do at her first day of preschool (MMO)? I was so nervous today, I woke up at about 5:30am (which would normally be unheard of from me). I am seriously not a morning person, but I wish I was. I could stay up all night, but no matter what time I go to bed, I do not like getting up in the morning. Today was Kate's first day at preschool. Well, they call it preschool, but I am only sending her one day a week for three hours (three days seemed a little to much for a 16 month old) so it is really more like a mother's morning out for me. Justin dropped her off. The preschool is at a church about 2 minutes from where he works. I also didn't trust myself. I didn't want to be that babbling idiot crying when I dropped her off. I did cry when he pulled out of the driveway with her. At least I was able to experience that by myself. So the big question... how did she do? I was nervous because she cries almost everytime I take her to the nursery at our church on Sunday mornings. Justin assured me that she had no problem today. She walked right into that class and starting playing with toys. When her daddy proceeded to tell her "bye, bye", he was expecting some crying... running to him... clinging on him, etc. I think he was a little disappointed when she responded with a look up at him, a wave and a nonchalant "bye, bye" out of her mouth. She is seriously growing up.. and is going to be just fine at her MMO. I just hope she isn't disappointed tomorrow, when she is stuck with me all day again. I am heading to pick her up now and I am hoping she is excited to see me!